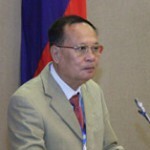 Dr. Akhom TOUNALOM is the Vice Minister of Natural Resources and Environment of Lao PDR. He has over 20 years of experience as a lecturer at the Lao National University. He was the Director of the Inventory Division under the Department of Forestry, Ministry of Agriculture and Forestry. He was Chairman of the Economic and Finance Committee of the Lao National Assembly. Tounalom received his PhD in Agriculture in 1985.